"A naturally fermented, spongy, gluten-free flatbread from Ethiopia is made from teff flour and water, using wild yeast to ferment over a couple of days. 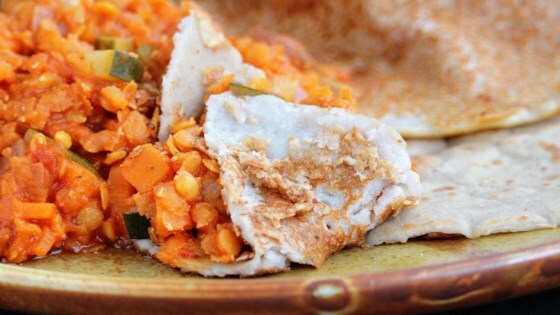 It is then cooked like a crepe and turned into a flavorful, tangy bread to serve with your favorite Ethiopian food. The fermentation process can take up to 2 or 3 days, depending on your climate. Injera is typically served with vegetables and/or meat on top where the bread is actually an eating utensil." Mix 1/2 cup white teff flour and brown teff flour together in a bowl. Add 1 cup water and whisk well. Pour mixture into a glass container large enough to hold 3 times the original volume. Cover with cheesecloth or other breathable fabric to keep out dust; do not seal with plastic wrap as air circulation is vital. Leave covered container in a draft-free environment; the mixture needs air to be circulated in order to ferment. Stir batter 2 times over 24 hours. Check for bubbles and possibly an increase in volume after 24 hours; there may also be a slightly tangy and sour smell. When you notice these things, add 1 tablespoon white teff flour and 1 tablespoon water to the batter and whisk well. Check in a few hours to see if bubbles have again formed, mixture has increased in volume, and the pungent smell is still evident; if so, the batter is ready and you can skip to the cooking process (step 5). Leave batter to rest another 12 hours if the mixture has not begun to form or smell sour after the first 24 hours; stir once during this time. Check to see if bubbles have formed, mixture has increased in volume, and a pungent smell is evident; if so, proceed with step 4. Mix together 2 tablespoons white teff flour and 2 tablespoons water in a bowl, making sure there are no lumps. Add mixture to the batter, whisking well. Wait a few hours; batter should be bubbly with a noticeable increase in volume and a pungent but fragrant smell, indicating it is ready to be cooked. Heat an 8-inch crepe pan or nonstick skillet over medium heat. Add oil. Pour a scant 1/2 cup batter slowly and steadily into the hot pan in a circular motion from outside to inside. Cover the pan completely in a spiral without swirling. Cover, reduce heat to medium-low, and cook, allowing steam to cook the top of the bread, 1 to 3 minutes. Remove from pan with spatula and transfer to a plate; cover to keep warm. Repeat with remaining batter. See how to make homemade pita bread in your bread machine. The objective of the fermentation process is to achieve a liquid mixture (like a crepe batter) with a slightly pungent smell and a moderate increase in volume. This can take up to 3 days but could occur in 12 hours, depending on the humidity and temperature of the environment. Keep your eye and nose on the mixture to understand when it is ready. This recipe is how it worked for me in a relatively cool home with very low humidity.